Kickstarter has been a big hit lately in the Tabletop Gaming community. It’s been a service that has gained popularity with large companies that have been partaking in the system to generate interest and hype around their upcoming game releases. Recently I’ve backed a couple of campaigns from Midlam Miniatures and Mantic Games. I’ve had some mixed feelings on the whole matter, but I’ll get into those as we go along. 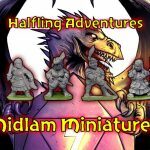 Midlam Miniatures from Gateshead, UK has been running some small run metal miniature kickstarters. The most recent one was called Halfling Adventures which consisted of 7 halfling miniatures casted with bases on. This style is an older style of casting, but something I don’t mind at all. One of the major projects I’ve been working on over the last few years is building an entire army out of Halflings. There has been a handful of companies that have run Campaigns specifically creating Halflings, and Midlam is one of them. Midlam Miniatures had a goal of £600 and ended raising £8,968 with 251 backers. What attracted me to this particular Campaign is that I am still looking for proper Halfling Heroes and Generals and they had some figures that would fit both a Hero in “Ronnie Bigsword” and a friar or healer in “Belinda Blackberry”. Another unique feature of this kickstarter is that they’re sculpting these minis in a traditional hero pose and also in a sleeping (or dead) pose. I’m hoping to use the Sleeping (or Dead) miniatures as wound markers in the Kings of War ruleset. The scupltor really puts some neat character into their miniatures and I’m excited to see them in person. 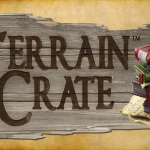 Mantic Games – TerrainCrate – Plastic, affordable, fantasy terrain! Mantic Games is no stranger to Kickstarter with Kings of War, Warpath, Deadzone, Dungeon Saga, and now TerrainCrate. Mantic’s latest kickstarter offered up a whole range of plastic items for Tabletop Gaming. These items include things like boxes, crates, fences, walls, tents, and tables to name a few. This Campaign was broken up into three main sections, Dungeon, Battlefield, and Town. Each of these sections had multiple subsections with themed items in each. Mantic Games had a goal of $75,000 and ended raising $629,460 with 3,725 backers. What attracted me to this Campaign was the Battlefield section of items that included plastic options for all kinds of terrain. Modular stone fences, wooded fences and gates, tents, campfires, crates, barrels and even a horse and carriage or baggage train. Over the years I’ve been gaming, you’d be amazed how hard it is to find something to scale that fits the thing you’re escorting in a story mission. Mantic Games is also known for adding in something called Stretch Goals, an unofficial incentive system within Kickstarter, or maybe loosely official? Throughout the Campaign all kinds of additional items were added to each of the sections of the Kickstarter, which creates additional hype around the campaign. I’m excited to see this ship next year and add these things to my Tabletop Wargames. I appreciate that companies that range from a ‘Mom and Pop’ shop to a larger gaming company have a method to raise capitol to produce cool game products. I personally have a larger interest in small companies, like Midlam Miniatures, getting a means to make a living at making miniatures in small batches. This Campaign feels like it fits what Kickstarters intent is, which is to offer a way for you to invest into small companies and their products. Mantic is a well established miniatures manufacturer who frequents Kickstarter to raise money to expand their range of miniatures and games. I’ve backed a few of their Campaigns over the last few years and have been impressed with their results. Specifically, Dungeon Saga was a great release if you ignore the Adventurers Compendium release that was riddled with typos and missing page references. What I’m not sure about is why Mantic feels the need to head to Kickstarter versus offering up a pre-order, the results from me would be similar, as it’s no mystery that I’m a fan of Kings of War and Dungeon Saga. As a result, I can’t help but feel like Mantic Games is using this as a crutch, but maybe I’m reading too much into this subject. 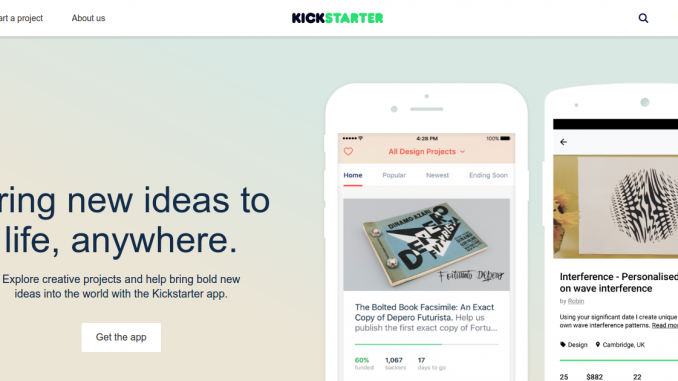 Overall, I look as Kickstarter as a positive, but it’s not without it’s faults. What do you guys think about Kickstarter and the monstrous games that have been funded as a result? Leave us a comment on Facebook with your thoughts.